Metal Colorado state tray. Measures 11", goldtone metal, multi colored instead of the standard black, and quite striking. 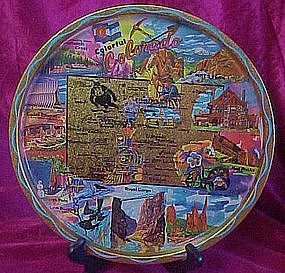 There is a picture of the state flower (colombine), a map of the state showing many of the key landmarks, such as Pikes Peak,royal Gorge,Molly Brown's house, Red Rocks and lots different attractions cities and Denver. The tray is in excellent condition. A very nice souvenir.